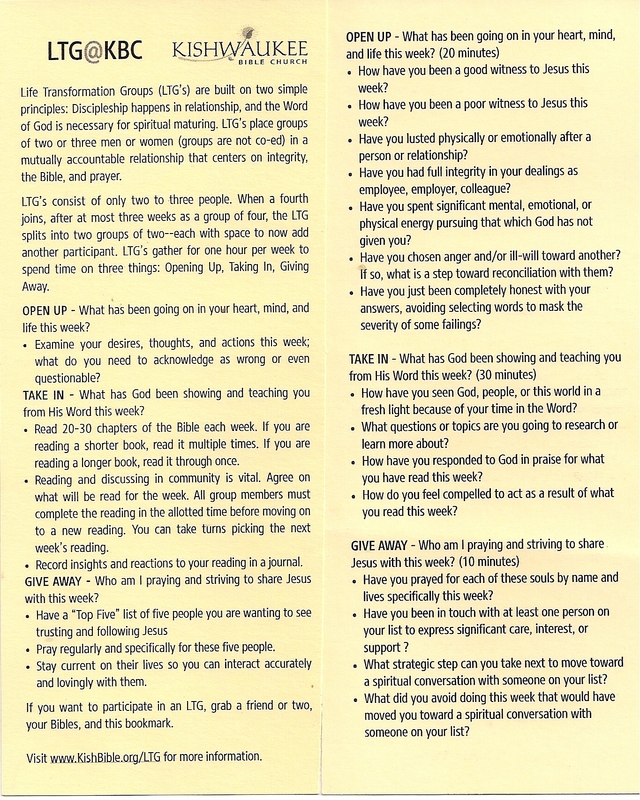 Life Transformation Groups. (LTG’s) A Mutual Mentoring Movement. This was implemented in our church. Groups of two or three people meet weekly. They read 20-30 chapters of the Bible per week and talk about their Christian walk, victories, struggles, outreach, etc. It takes about an hour each time people meet. 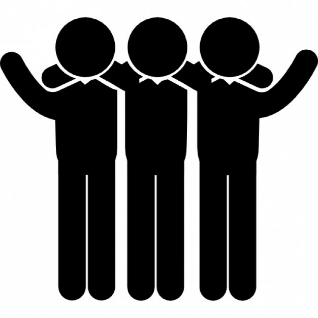 If the group grows to 4 people they split into two groups. I am really excited this new initiative. Formal and informal surveys agree: Discipleship–growing as a follower of Jesus–happens in relationship, and spiritual transformation–becoming who God wants us to be–happens as we spent time in the Bible. Practically speaking, what is an LTG? An LTG is a group of two or three men or women (groups are not mixed gender) that meets for one hour each week and practices accountability in integrity, Bible intake, and prayer. There are three categories that guide the discussion and prayer time together: Open Up, Take In, and Give Away. OPEN UP – What has been going on in your heart, mind, and life this week? Examine your desires, thoughts, and actions this week; what do you need to acknowledge as wrong or even questionable? TAKE IN – What has God been showing and teaching you from His Word this week? Read 20-30 chapters of the Bible each week. If you are reading a shorter book, read it multiple times. If you are reading a longer book, read it through once. Reading and discussing in community is vital. Agree on what will be read for the week. All group members must complete the reading in the allotted time before moving on to a new reading. You can take turns picking the next week’s reading. Record insights and reactions to your reading in a journal. GIVE AWAY – Who am I praying and striving to share Jesus with this week? Pray regularly and specifically for these five people. Stay current on their lives so you can interact accurately and lovingly with them. Are LTG’s a sure-fire way of being a disciple of Jesus and becoming more like Him? No. But the practices encouraged by LTG’s are the means God has chosen to accomplish both of those goals. We encourage you to grab a friend, your Bible, and the LTG info and take the next step in following Jesus and becoming more like Him. The full LTG format is available here. We have printed bookmarks with the LTG info and questions available for you on Sundays, or, if you’re a digital Bible user, bookmark LTG@KBC on your mobile device so you can find it easily when you’re with your group.